Bumble bees Larger than a honey bee, yellow and black in color, these are our only native social bees. They nest in the ground and will sting. Bumble bees are social insects. Nests are usually constructed underground, and consist of a series of more-or-less spherical, waxen cells–some of which hold the eggs and young. Some of the cells also serve as storage receptacles for honey and pollen. Nesting sites may be depressions in the ground, deserted mouse nests, hollow logs, cavities in rotten stumps, railroad tie retaining walls, or even piles of grass, weeds or rubbish. Bumblebee colonies are smaller than those of honey bees or yellowjacket wasps, and usually consist of only a few hundred individuals. Colony sizes increase throughout the summer. With the advent of cool weather most bees die, with only one or a few queens surviving the winter in sheltered locations. Bumble bees can become pests when their nests are built near humans. Though not as likely to attack people as other social insects, like yellowjacket wasps, bumble bees can and will sting. In addition, unlike honey bees, bumble bees can sting repeatedly. Stings are most likely when a nest is disturbed. Bumble bees rarely sting if they are merely disturbed during pollen gathering visits to flowers. Carpenter bees Similar in appearance to bumble bees, but hairless on the top of the abdomen, carpenter bees are known for the round holes they chew in wood to make their nests. 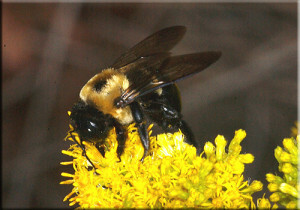 Carpenter bees are similar in appearance to bumble bees, but lack hairs on the top surface of the last body segment (abdomen). 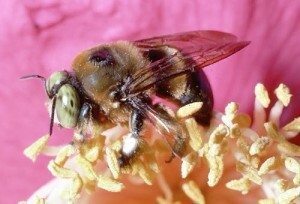 Carpenter bees are not social insects and do not sting to defend their nests. Their nesting activities, however, can damage wooden decks, patios and other structures due to their habit of boring nest holes in soft wood. Honey bees – Control in and around homes Honey bees can become pests when they nest in or around homes. Control involves nest removal. Honey bee swarms and their control One of the most interesting honey bee behaviors, swarms elicit both fear and fascination. 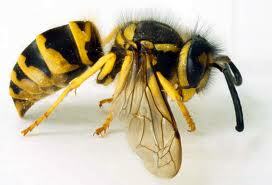 Wasps, yellowjackets, and hornets can become a problem if they are found near humans and domestic animals. These insects may nest around homes, in commercial buildings, farm structures and equipment, in parks and in other areas where people live, work, and play. yellowjackets, accounting for the overwhelming wasp majority of stinging incidents in the state of washington . 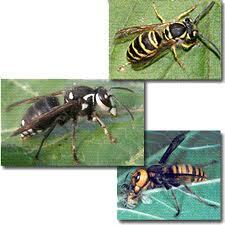 These are all in the genus Vespula and the most noxious species is the western yellowjacket. Yellowjackets produce a paper nest but the site of the nest is concealed, in an abandoned rodent nest below ground, behind an exterior wall, in hollows of children’s playground equipment, etc. Yellowjackets have diverse tastes. Although they feed on some insects, they readily scavenge sweets and protein-rich foods. They can be serous nuisance problems around uncovered garbage and at outdoor dining areas in late summer. yellow jackets are ground-nesters. Their colonies can be found under porches or steps, in sidewalk cracks, around railroad ties or at the base of trees. Sometimes the queen uses a wall void of a building as a nesting place. Some yellow jackets build aerial nests in bushes or low-hanging branches or in the corners of buildings and other manmade structures. Perhaps more commonly observed, but far less commonly involved in sting incidents are the “hornets”. These make paper enclosed nests in trees, shrubs and under eaves that may exceed the size of a football. They are produced by members of the genus Dolichovespula. The baldfaced hornet, a large black and white wasp, is the most commonly encountered member of this group. Hornets are primarily predators of other insects, rarely visiting garbage or outdoor dining areas. Bald faced Hornets Bald faced hornets are up to 3/4-inch long with black and ivory white markings on the face, thorax (middle body part) and tip of the abdomen. The bald faced hornet is a member of the yellow jacket family. They are aggressive and will attack anything (or anyone) that invades their space. They can sting repeatedly and their sting is very painful. Bald faced hornets build paper-like nests, which are grayish-brown, inverted, pear-shaped, and up to three feet tall with the nest entrance at the bottom. Each nest consists of a number of horizontal layers, stories or “tiers” of circular combs, one below the other completely enclosed by a paper-like envelope as a covering. Also, the cells are not exposed to view. Nest are built hanging from trees, bushes, vegetation and occasionally buildings. Then there are “umbrella wasps”. These similarly make their nest cells of a papery material, but do not enclose it with a papery envelope. As with the hornet these have a generally beneficial habit, rearing their young on insects that they capture, but will sting when defending the hive. Wasp species are categorized as social or solitary. As their name implies, social wasps live in colonies, which may number in the thousands. Within these colonies, female workers perform all duties within the nest. Solitary wasps live alone and therefore do not have a colony. They do lay eggs, but their eggs are left alone to hatch. Some wasps are predatory, while others are parasitic. 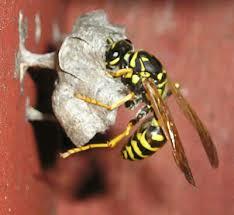 Predatory wasps kill and consume other insects as well as other animals which they often feed to their larvae. Parasitic wasps typically lay their eggs in the bodies of living creatures like caterpillars or spiders. The larvae feed on the still-living host. Wasps can assist in the management of other pests, particularly in agriculture as biological control agents. Many wasps also feed on nectar from flowers and therefore function as pollinators. Some wasps are aggressive species and can sting when threatened. Unlike honey bees, wasps often are capable of stinging multiple times.